We believe patient focused customer service is fundamental to our success. Testament to that is our incredible one-hour guarantee. This means that any customer who contacts Scope Ophthalmics from Monday to Friday (9am-5pm) will receive an answer within 60 minutes. BlephEx™ is the first of its kind for treating blepharitis. 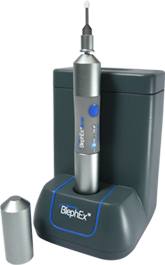 BlephEx™ is designed to give the eyelids a deep clean (like going to the dentist!) to remove the debris and crusts that build up and contribute to the sore gritty symptoms of dry eyes. The treatment is recommended roughly every 6 months. Omega Eye is a highly purified and concentrated Omega 3 oral supplement specifically developed to relieve the symptoms of dry eye and blepharitis from within. Recommended and used by leading eye doctors in the UK and Ireland and now available to customers with free guaranteed next day delivery and backed up by the dedicated support of our team of Nutritionists. If you wish to speak to one of our sales or customer service team, please contact our head office in the UK on Freephone 0800 270 0253 and we can give you the details that you need. Please note that the freephone number is only manned during office hours and does not have a voicemail service.